The international break might be here, but there can be no doubting that the only football that people are truly looking forward to is how the business end of the Premier League seasons pans out. In one of the most exciting and cut-throat title fights in recent years, Liverpool and Manchester City continue to set the league alight with a remarkable back-and-forth contest. Below them is an equally enticing top-four race, with Tottenham's dramatic slump in form seeing them nervously looking behind their backs. Spurs, Arsenal, Manchester United and Chelsea are all battling out for the two places remaining in the coveted Champions League spots, and each side can all make a genuine case for doing so. With the disclaimer that I don't have a mystic ball, below is a look at where the Premier League's famed 'big six' might actually end up when it's all said and done come 12 May. ​After a shock 2-0 defeat to Everton just before the international break, ​Chelsea missed the opportunity to go level on points with Arsenal in the hunt for a top four spot. Maurizio Sarri's side have struggled to adapt to their new manager's methods and out of the current top six, are perhaps the side looking the least likely to go on a significant winning run in the latter stages. Even more importantly for the Blues was the kind Europa League draw they received for the quarter-finals, with the relatively less-fancied Slavia Prague. With a potential route into the Champions League next season coming via a triumph in this year's Europa League, Sarri's side may well ease off in the ​Premier League and put all their eggs in one basket. After a simply stunning run of form since Ole Gunnar Solskjaer took charge, ​United were brought back down to Earth when they fell to a 2-0 defeat to top-four rivals Arsenal at the Emirates. That was then followed up with the Red Devils crashing out of the FA Cup quarter-finals in fairly meek fashion to Wolves, and may just be thankful that the international break has come up. If United can stay injury-free, and that's a big if, then Solskjaer's side have every chance of going on another incredible winning run to finish in the top four. Their Premier League destiny undoubtedly rests upon their fixtures in April which read - Wolves (A), West Ham (H), Everton (A), Man City (H) and Chelsea (H). Those games also include a two-legged quarter-final against Barcelona in the Champions League sandwiched between them. The City and Chelsea games look particularly pivotal to their chances of finishing in the top four; win both and they should get there, drop points in both and that could well be the end. Having suffered back-to-back defeats in their opening two games to both Manchester City and Chelsea, who would have predicted Unai Emery's first season in charge of ​Arsenal would see them in the top four in the middle of March and in the quarter-finals of the Europa League? The Gunners have showcased that at home they are a formidable opposition, and in beating Manchester United, saw them leapfrog the Red Devils and into fourth. That game against Solskjaer's side was Arsenal's last fixture against another member of the 'big six' and on paper, they have the best run-in towards the end of the season. However, their biggest issue lies in the away-heavy nature of their remaining games. After facing Newcastle at the Emirates when the clubs return from the international break, Emery's side face five away games in their final seven. To add a little context, the Gunners have won just the one away fixture since December. If their Spanish boss can get their away form alive and kicking then the Gunners are well placed to make their return to the Champions League; if they can't, then they will have nobody but themselves to blame. ​Out of all the sides in the 'big six' desperate for the international break, Mauricio Pochettino's men needed it most. After being considered a dark horse in the title race just a month ago, a run of wretched 'Spursy' form has seen them fall out of contention for the league title, and more worryingly, looking over their shoulders to just stay in the top four. The north Londoners lie just three points above fifth-placed Manchester United, and still have to face both Liverpool and Manchester City in their remaining games. An even bigger X-factor comes in the shape of their new stadium; set to be officially opened next month, ​Spurs could very well feed off the incredible atmosphere at their new ground and propel themselves back into winning form. Or, trying to adjust mid-season with a stadium move could prove to be too much too soon, and see them slip out of the top four altogether. Pochettino's side also have the added element of their Champions League quarter-final with Manchester City as well, and that could prove to be a potentially season-defining 'distraction' for a set of players whose mentality has already been called into question in recent years. Two points clear of Manchester City (having played a game more), and a plum Champions League tie against Porto, it is all set up for ​Liverpool to have a truly legendary season. Jurgen Klopp's men missed out on both last year, but have kept up the pace this season, and ​it would be truly heart-breaking for the passionate Anfield faithful to slip up once more. No pun intended. The Reds' most difficult fixtures come in the shape of Tottenham and Chelsea at home, and if the title race does come down to the final day, then they face a potentially trick clash against Wolves, who have been notoriously good against the division's best sides this season. As it always does when it comes to titles and trophies, it will come down to who can hold their nerve better. The Reds certainly have the technical quality to do so, and in Virgil van Dijk have a real leader at the back. Klopp's biggest concern might be the allure and possible distraction of another Champions League final, and whether that might just take their eye off the ball in the league. The Reds face Porto, Chelsea and then Porto again in the space of eight days, and that one week will no doubt shape their destiny in the Premier League and in Europe. The quadruple is well and truly on. City boss Pep Guardiola has done his best to downplay things at the Etihad, but with a Carabao Cup triumph under their belts, and 'favourable' draws in both the FA Cup and Champions League, the side could achieve something historic. The Citizens currently find themselves two points behind leaders Liverpool, but with a game in hand. Their biggest week of the season comes in mid-April when after facing Tottenham at home in the second leg of the Champions League quarter-finals, they host Pochettino's side again just three days later, before rounding off a seismic few days with the small matter of the Manchester derby at Old Trafford. Just as with Liverpool, how big a part will European commitments play on the nature of their Premier League performances? 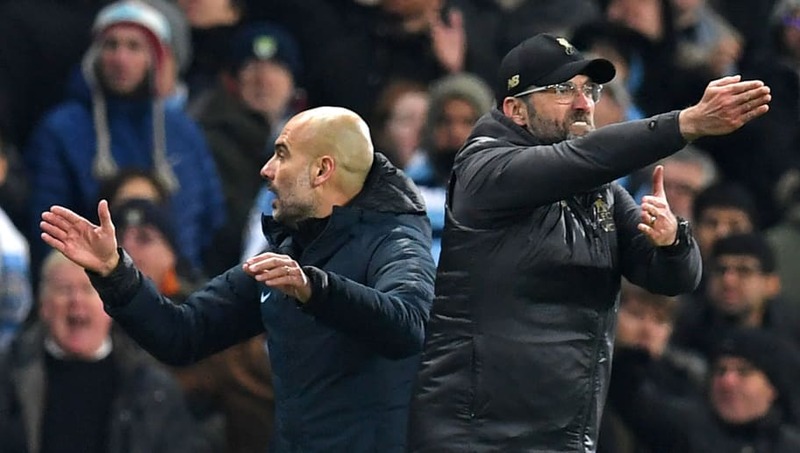 Certainly, City have more of a squad for Guardiola to choose from than his German counterpart at Anfield, but will the pressure of being favourites in almost all the competitions they're involved in eventually take its toll?